Figure 1. Long White Candle (basic candle). This article describes the Long White Candle basic candle. In literature, the Long White Candle is called as a Long White Day. We use the term Long White Candle, however, as the day term is ambiguous when using intraday charts. While analysing the situation on the chart, it is always the most important to observe what is happening at the very moment. Thus, to determine whether the candle appeared on as a long or as a short line, the last quotes are crucial. If the volatility of the market is at a low level for a long time, even a small breakout can be enough to form a Long White Candle. However, on the same chart later, when the market volatility is much higher, a candle has to be appropriately larger in order to recognize it as a valid Long White Candle. 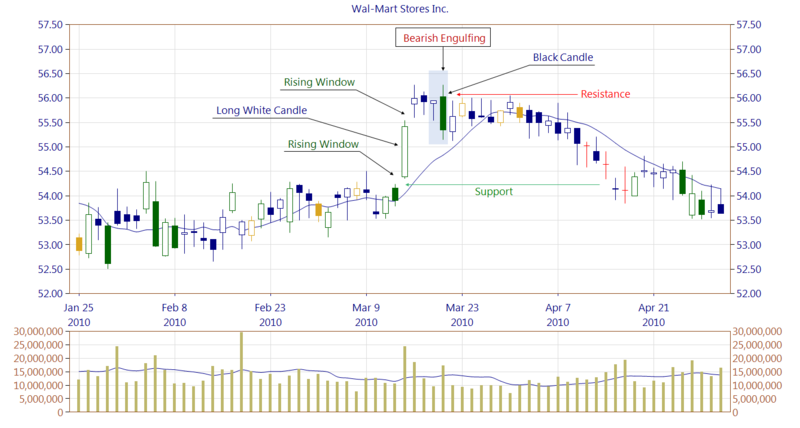 Many analysts make a mistake in determining whether the candle is a long or a short line, based on historical charts. They forget that at the time when a candle is being formed, it is not clear how the market will look like in the future. In other words, if today we have a candle on the chart meeting requirement of a valid long line, it does not mean that the same requirement will be met in the future. What seems to be extremely long today, may not be so long at a later time when the market volatility will rapidly grow. Some authors (e.g. 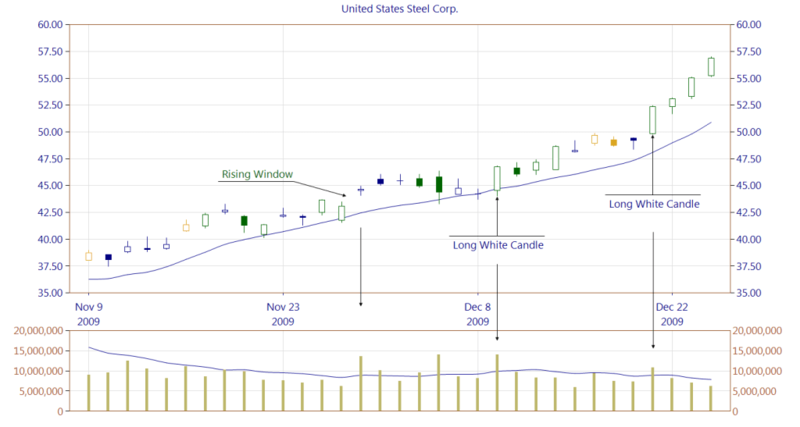 Bulkowski) classify Long White Candle as a (bullish) continuation pattern. Let's think for a while if this should be considered as a correct interpretation. First of all, the candle would have to appear only in an uptrend –- otherwise we could not call this pattern as a bullish continuation one. But this is not true, as we can find this candle either in an uptrend or a downtrend. Secondly, Long White Candle is not a pattern per se, it is a basic candle, and can be a part of both, bullish and bearish patterns. 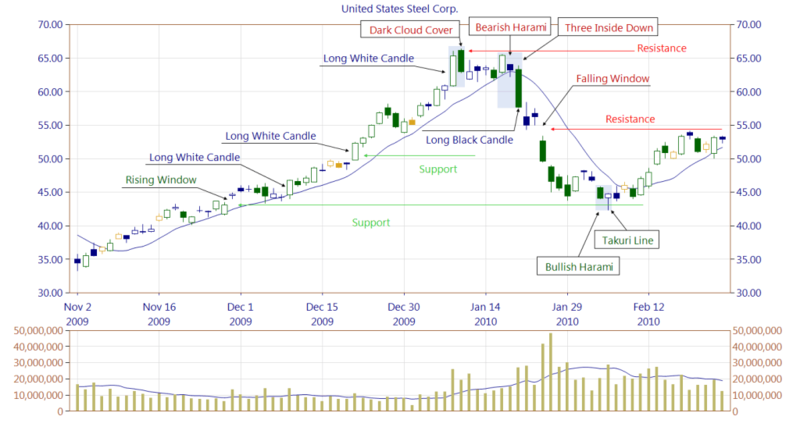 Some people tend to think of this candle as a bullish one, but in fact it can appear as a part of, for instance, Bearish Engulfing or Dark Cloud Cover patterns. Thirdly, if this candle is formed at a low trading volume, it is recommended to be very suspicious as it comes to its bullish significance. According to Nison, the emergence of a long white candlestick body (i.e. excluding shadows) after a series of declines, can indicate a change in the current trend. Especially if the close price is located at a higher level than the close of several previous candles. Nison also adds that when the Long White Candle appears during an uptrend and breaks some important recent resistance level, there is a good indication of the continuation of the trend. The higher the volume when Long White Candle is being formed, the stronger the signal is. Long White Candles, accompanied by a large trading volume, should also be considered as a support zone. Support level appears within the middle and the low price of such candle. Others are treating as a support zone the whole Long White Candle. Figure 2. A Long White Candle at a very high trading volume. Its significance is strengthened by gaps before and after its occurrence. The established support area is very strong. Next three days are a classic example of market consolidation. On the fourth day, after the Long White Candle is formed, a Bearish Engulfing pattern occurs. Its second line, a Black Candle (formed at high trading volume) creates a zone of resistance. The market could not overcome that resistance in the following days and, consequently, a gradual decline occurred. Support zone got eventually broken. Figure 3. First Long White Candle is accompanied by increasing trading volume. Before this candle was created, the market was in a weak uptrend. Then a Rising Window pattern appears (formed at a high trading volume) which makes the trend much stronger. A Long White Candle confirms this move which is continued. Then one more Long White Candle appears on the chart that again confirms the strong uptrend. All Long White Candles appear at a high trading volume. In the future, those candles will become strong support zones. Figure 4. Above example is the part of the chart also shown in the Figure 5 below. We split that intentionally, and the reasons for that are clear after studying both figures. There are two occurrences of White Long Candles. It is, however, critical to pay attention to the instance of a Rising Window pattern that is formed earlier at a high trading volume. This is a key trading session for the future behavior of the market what is presented on the Figure 5. The chart shows an instance of a gap that size is 1.29%. Also the trading volume, when the Rising Window was being formed, is higher than the average. Both details are better visible on Figure 4 than on the this one which shows the same chart in a broader period (Figure 5). In practice, most instances of Rising Windows creates a zone of support. Indeed, a few months later, this support will protect the market against the continuation of the downtrend (see Figure 5). Figure 5. After the occurrence of Rising Window, the market is trying to turn back down unsuccessfully. 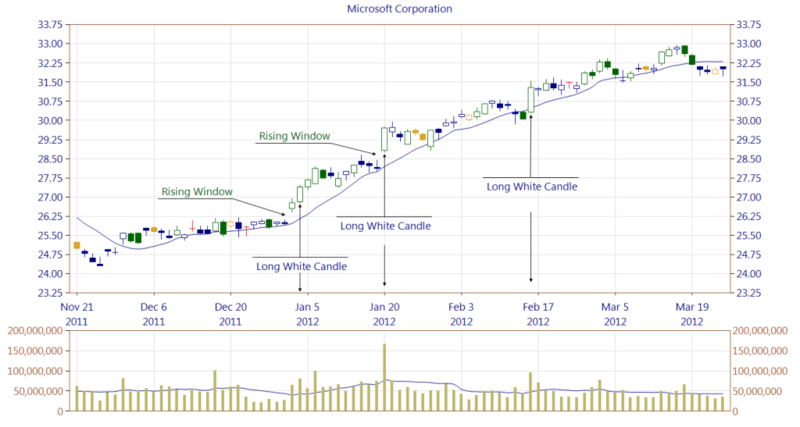 The first occurrence of Long White Candle takes place on a high trading volume, and the market goes up. The next appearance of Long White Candle clearly indicates the direction in which the market follows, creating another support level. Two Black Candles slow down the way to the north a bit. When to blend these two Black Candles into one we could notice a Bearish Engulfing pattern. Its weakness is, however, the low trading volume below the average. The third occurrence of aLong White Candle is accompanied by a very high trading volume, and the third zone of support is formed. The next day, the market opens at a small gap of 0.18%. Some of the traders probably would not like to see that the market is increasing from the level of about 36.80 and already reached 66.20 which is about 80% profit within two months. The day is closed by a Black Candle forming a Dark Cloud Cover pattern. The market found itself in a stalemate: on the one hand, the third occurrence of Long White Candle acts as a support, but, on the other hand, the Black Candle appearance acts as resistance. The support of the Long White Candle works for seven days. There is still an attempt made to break the resistance of the Black Candle being part of the Dark Cloud Cover pattern, but the attempt is unsuccessful. Then there is a Bearish Harami formed (the last two candles above uptrend). The confirmation of the trend reversal is a Three Inside Down pattern (see Long Black Candle), which breaks the support of the last occurrence of Long White Candle. In the following days, everyone wants to realize the profit generated within the last two months. All the support areas formed during the three instances of Long White Candles gets broken. The chart deliberately does not show the support line after the first occurrence of Long White Candle. We can notice now that the market was rescued on 5th February, 2010 (Takuri Line pattern) by the support created by the Rising Window pattern formed on the 30th November, 2009 (Figure 4). The last occurrence of Long White Candle appears as the first line of the Dark Cloud Cover, which is a bearish reversal pattern. It is an example showing that the Long White Candle is not necessarily always a bullish signal.